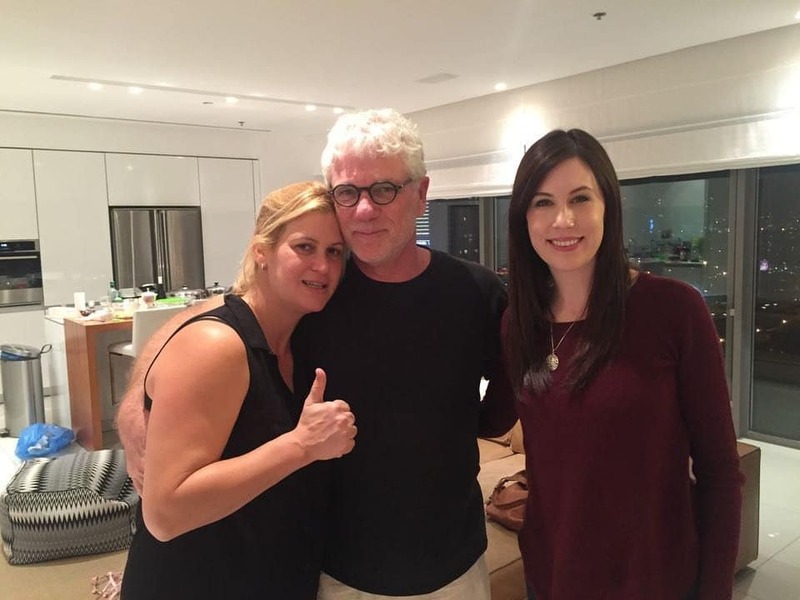 On our most recent trip to Israel, my husband and I were invited to Shabbat dinner at the home of our friends, film director Doron Eran and his wife Billy Ben Moshe. Shabbat at their home in Tel Aviv is cozy and fun, a weekly celebration with family and friends. 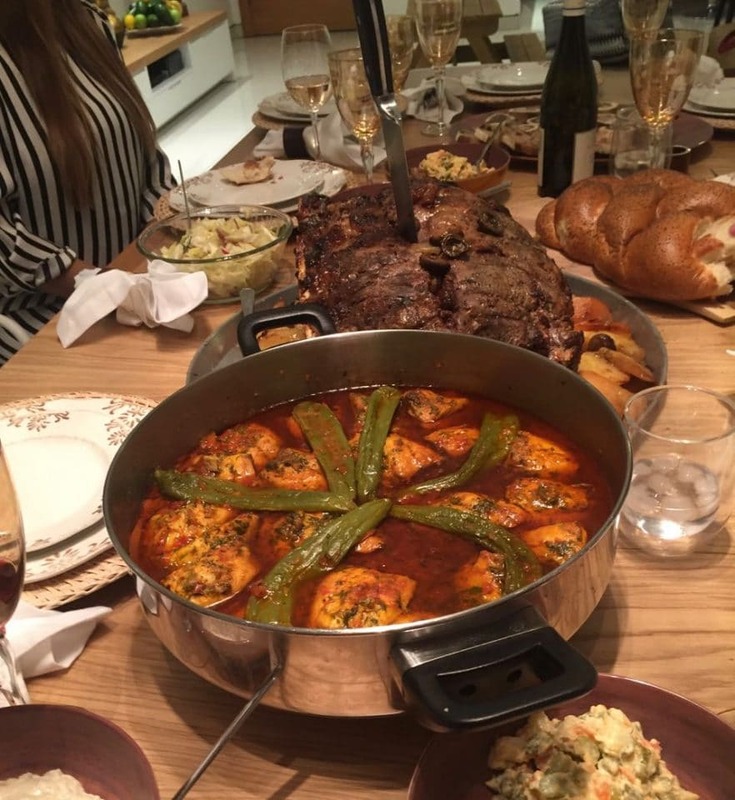 Billy goes all out when she cooks for Shabbat, serving course after course of beautiful food. Her family is 7th generation from Tiberias, Israel, a city on the western shore of the Sea of Galilee. She serves dishes from a variety of backgrounds, all home-cooked with love and care. She spends hours cooking for Shabbat, presiding as the chief mama in charge over a weekly celebration of life, love and family. With Billy and Doron at their home in Tel Aviv. Billy truly goes all out when she cooks a meal. 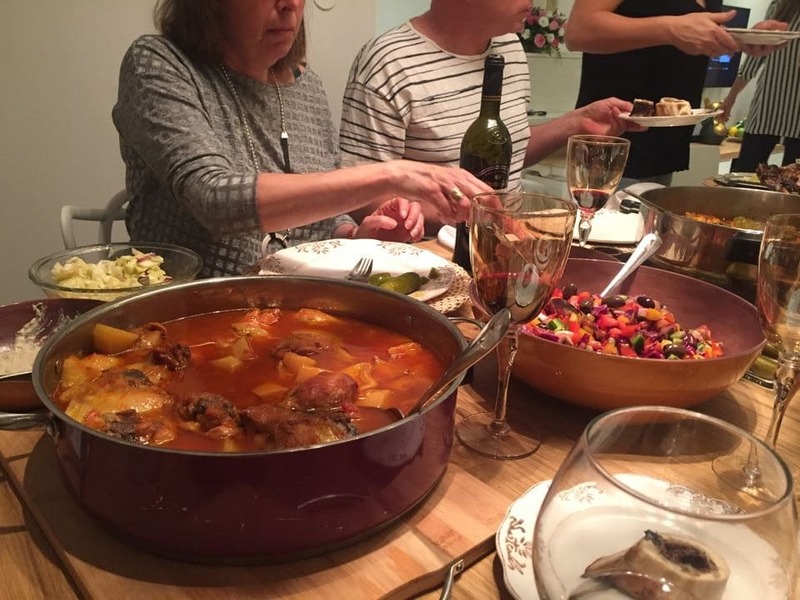 She brought dish after dish to the table – fish with peppers in paprika sauce, tender chicken slow-braised in a spicy red sauce, an enormous roast with olives and potatoes, marrow bones with bread, and salad after salad after salad. Shabbat dinner is truly a labor of love for Billy, and it shows. 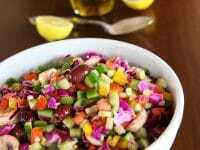 While we prepared to sit down and eat, I sent out a picture through Facebook and Twitter of one of Billy’s salads – a very colorful mixture of fresh vegetables straight from the kibbutz. I received lots of requests to share it here on the blog. 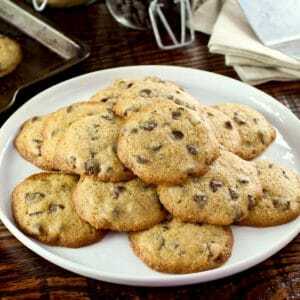 Billy kindly shared the recipe, which is easy as can be. The result is downright delicious! 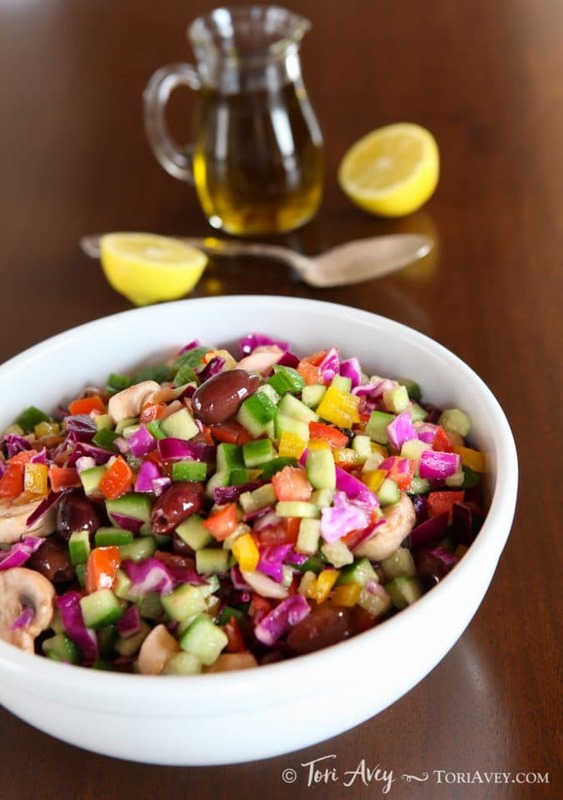 This colorful take on Israeli salad is filled with a flavorful mixture of vegetables. It has a nice, fresh crunch. The simple lemon and olive oil dressing brings it all together in perfect harmony. While it’s easy to make, it looks beautiful on the table thanks to all of that lovely fresh produce. This salad is the perfect addition to almost any meal– I’ve even enjoyed it for breakfast alongside a frittata. Enjoy! 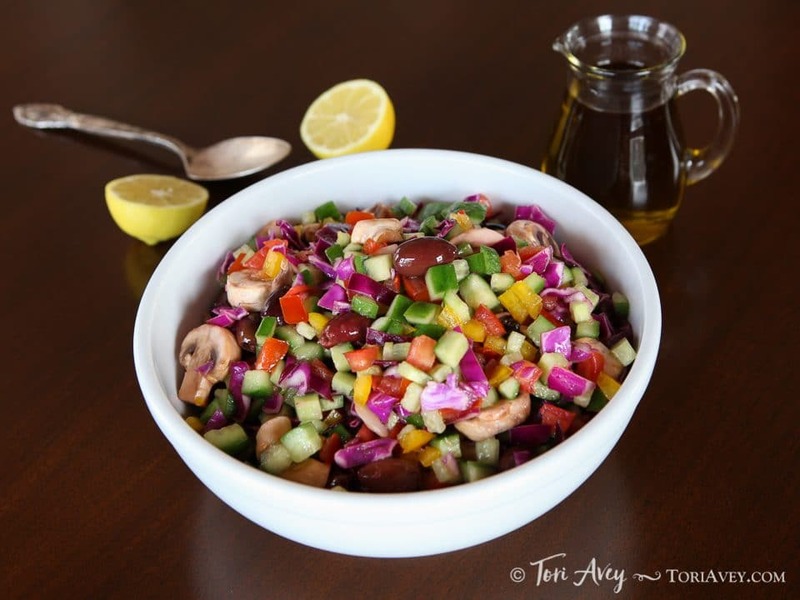 Make this colorful vegan side dish from Israel. Dressed with lemon and olive oil. So easy, pretty, and flavorful! Combine all vegetables in a large mixing bowl and mix well. In a small mixing bowl, combine lemon juice, olive oil and salt. Pour over the chopped vegetables and mix well. Serve. Looks amazing! I am not a fan of Olives (but everyone else IS!) 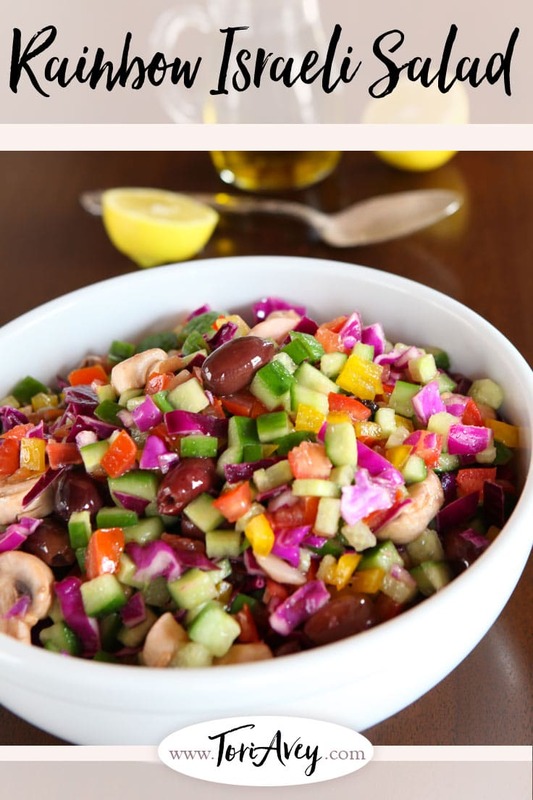 so I will definitely make this beautiful salad soon. Looking forward to my FIRST trip to Israel at the end of October and hoping to get more inspired…..Thank you for your lovely website. Can you make this ahead and refrigerate it? If so, how long? Thank you! Yes, 24 hours ahead is fine. Hi, Tori, I grew up in small town Indiana, with little exposure to anything but midwestern Yankee cooking! As an adult I learned a bit about Iraeli cooking. I LOVE matzo ball soup, and it seems like I’ve loved it forever! 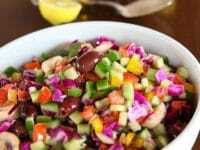 This rainbow salad looks absolutely smashing–like something that could have come out of our garden, or that of neighbors (except perhaps for the kalamata olives, but they look great to me!). Thank you for sharing this. 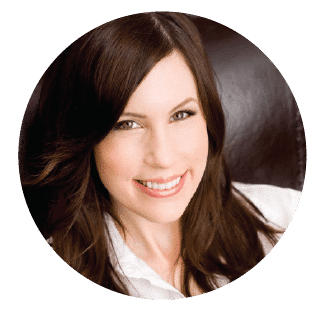 I have enjoyed wandering around on your web site, and have found several recipes to try–including the one whose name I can’t remember but is made from fresh apples and frozen pastry, with a date filling. Yum! Thank you for sharing these many exciting receipes with me and others! Excellent, so tasty and inviting. Thank you. The salad looks delicious and I am going to try it soon. When it’s just one it’s a little difficult to prepare such a spread for shabbat meal. Hope to change the number soon. I look forward to trying this Israeli Salad. Thank you for sharing! If Billy is willing to share other recipes, that would be wonderful (especially the fish w/peppers in paprika sauce and slow-braised chicken in spicy red sauce). Love the pictures and the recipes you send out. Keep it up!! These photos are so representative of Shabbat in Israel. The food and the love is truly a celebration! Thank you Tori for sharing the wonder of your knowledge! Had a variation on this at a kiddush several weeks back. 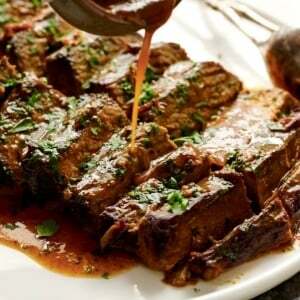 Primary difference was the use of a little chopped coriander leaves, which give it an interesting lift. Do you happen to have a good recipe for pashteda? In Israel it is a staple dish, low fat and full of seasonal vegetables. These dishes looks absolutely marvelous. I would like if possible to get some recipe’s please.